Hundreds of domestic workers, construction workers, trade union members, advocates, civil society organisations, working women and youth participated in #March4Women, a silent march to demand safer and more gender-equal working conditions. 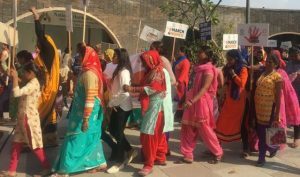 This march was part of a larger campaign organised by CARE India and PAHAL, two non-profit organisations working to bring an end to gender-based violence. The march was flagged off by prominent personalities like Avijit Dutt, filmmaker, theatre director and writer, Hrishitaa Bhatt, film actor and social activist, Suneeta Dhar, Advisor at Jagori. The march culminated with the signing of a Charter of Demands. The signed Charter of Demands will be presented to the government and advocacy measures for formalising the demands will be made. #March4Women 2019 was launched on March 8, to commemorate International Women’s Day. This year’s campaign focusses on spreading awareness about the International Labour Organisation’s Convention on Violence and Harassment in the World of Work. The week-long pre-event awareness activities included discussions and dialogues, street plays and other engagement activities on gender-based violence in the word of work were conducted across Delhi for women in prisons, domestic workers, construction workers and trade unions. The main event, organised at Janakpuri’s Dilli Haat, today, included talks, panel discussions, theatre and cultural performances, calling for stronger policies and action on preventing harassment in the world of work and violence against women. A panel discussion focussed on issues of violence and harassment in the world of work, despite India having enacted the Sexual Harassment of Women at Workplace (Prevention, Prohibition and Redressal) law in 2013. Hrishitaa Bhatt, CARE India’s Brand Influencer took the stage and shared her experiences regarding facing harassment in the world of work. “As a woman, I believe I have a lot to do for the betterment of the women community and make it a better place for them to live a dignified life. Believe yourself because everyone is equal for nature,” she said.